DCF Guns offers a variety of memberships starting as low as $40 per month. 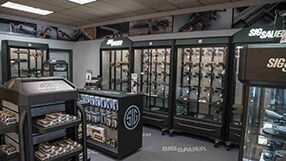 Our standout membership packages include gunsmithing, free classes, and gun cleaning services, plus discounts on firearms, ammunition, suppressors and more. Contact DCF Guns and find the right membership for you. We are not dogmatic technique, caliber nor pistol-type snobs; we believe that your mental navigation of the event is just as important as shot placement and we understand that everyone’s body is different and there is no one-size-fits-all in shooting technique. DCF cerakotes thousands of guns for discerning and demanding buyers. DCF will work with you to create your unique, long-lasting, gun preserving, and eye cathing design. Open to the public every day 10am to 7pm. DCF members may reserve lanes online. DCF offers pistol, rifle, and Class III machine gun rentals at the range. 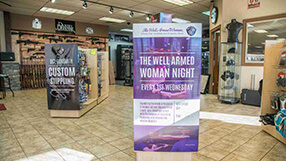 Members rent all guns free. Make DCF Guns your go-to gun range by coming to any of our shooting events. 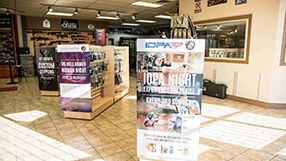 Hone your shooting skills and get to know other shooters in Colorado at our fun and skill-improving events like IDPA, Ladies’ Night, Concealed Carry and much more. 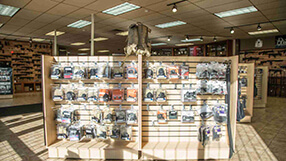 DCF Guns is Castle Rock’s premier indoor gun range that’s always ready to assist shooters in performance improvement and keeping you supplied with quality firearms and ammunition. DCF Guns has a constant supply of the latest and greatest offerings from all of the major firearms manufacturers and some lesser known brands. If it’s not in stock we can get it. We offer you thousands of guns you’ll find them in our racks or in cases.